The amazing style, versatility, and affordability of Butler® buildings make them the logical choice for a variety of commercial facilities. Whether you’re looking for a simple building solution, a retrofit roof, or a multiple building complex, Butler buildings offer a fast, affordable, architecturally appealing, and environmentally-friendly solution with many significant advantages. The benefits of using a Butler® building system are numerous and so are the advantages of working with Park Avenue Construction as your turnkey provider of building construction. At Park Avenue Construction, we are proud to be your local Butler Builder® representing the world’s leading producer of building solutions – Butler Manufacturing™. We are your experienced local construction partner from conceptual design to final landscaping no matter what type of facility you are trying to build. With many building projects under our belt – Park Avenue Construction brings a together local construction knowledge with a world class building solutions company. Our commitment is to provide every customer with an exceptional experience for their construction project. Butler® is the world’s leading producer of steel building systems. Butler® has more than 100 years of experience and is the world’s leading producer of building systems solutions. Ideal for manufacturing, athletic, religious and community facilities, Butler® building and roof systems offer superior performance, aesthetically pleasing design options, and proven sustainability attributes. There are many reasons for choosing to build a “green” or “sustainable” building—from the savings provided by its enhanced energy efficiency to the personal satisfaction that comes from being environmentally responsible. Whatever your motivation, Park Avenue Construction can provide a practical solution. 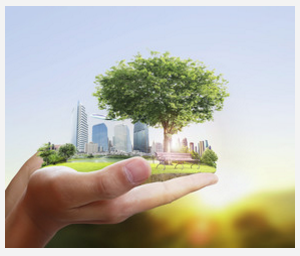 We have access to LEED® Accredited Professionals who are ready to assist with the design of your building. Of course, choosing a sustainable building design makes sense only if it can be delivered within your budget. And our ability to offer Butler® steel buildings makes sustainable building affordable. Butler combines the inherent green benefits of steel with the company’s own green systems and practices. The result is a building that: 1) contains a high percentage of recycled material and is itself recyclable, 2) optimizes the use of raw materials, 3) is energy efficient and 4) can help you achieve LEED® certification. As a Design-Build general contractor, Park Avenue Construction utilizes the “team concept,” which provides the customer with the greatest control over quality, cost and scheduling. This “team concept” method of project development brings all of the major participants -contractors, consultants, architect, engineer and customer – to the table at the beginning of the project to establish the initial concept for the job.